Mission Statement: To develop, implement and guide a watershed restoration plan that will help to reduce flooding, improve water quality, and maintain the stream for future generations. Muskingum, Morgan, and Perry counties. Moxahala Creek originates approximately four miles south of New Lexington in Perry County. 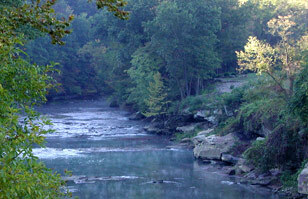 Moxahala flows north from Perry County to Zanesville, where it meets the Muskingum River which empties into the Ohio River. The major source of impairment in the Moxahala Watershed is acid mine drainage (AMD). AMD is so prevalent it overwhelmingly masks other potential causes of impairment. Five different types of coal mining have occurred within the Moxahala Creek Watershed, including strip mining, drift mining, slope mining, shaft mining, and auger mining. Approximately 13 square miles of the watershed have been strip mined, placing Moxahala as the second most strip mined watershed in the state. Additionally, 13.25 square miles have been deep mined, ranking at fourth among Ohio watersheds. Moxahala Creek experiences pollution beyond acid mine drainage. Other pollutants include bacteria, sanitary sewer overflows, and nonpoint runoff. In 1994, the Village of Crooksville created the Moxahala Watershed Restoration Commission to address issues of flooding and water quality in the area. The group’s primary focus eventually turned to water quality issues, and a watershed coordinator was hired with grant funding from the Ohio EPA. The OEPA worked with the coordinator to create a Comprehensive Watershed Management Plan. At this time, ILGARD researchers developed the AMDAT report, which has guided the Moxahala Watershed Restoration Commission’s efforts to remediate water quality in the watershed. The group has received major funding from the Ohio Division of Natural Resources’ Department of Mineral Resources Management (DMRM) the Ohio EPA, and the Office of Surface Mining Reclamation and Enforcement (OSM) "Appalachian Clean Streams Initiative" (ACSI). Smaller donations have been provided by the Village of Crooksville, the Clay Valley Foundation, and watershed coordinator John T. Kneen. The Misco Gob Piles are two heaps of mining refuse that were left off the banks of Bennett Run in the Black Fork subwatershed of Moxahala. They were abandoned in 1955 after mining ceased at the Misco Mine in Northeastern Perry County. The piles proved to be the most significant contributors of acid mine drainage (AMD) to Black Fork, and they were causing a public health and safety issue. They were partially reclaimed in 1990, but not to the extent that was necessary to reclaim the suffering stream. In 2004, a $1.3 million reclamation project was started which sequestered and buried the gob piles where they can no longer leach pollutants into the Moxahala Creek Watershed. The project was completed in 2005. The Tropic Wetland Reclamation Project started in 1994. A passive wetland treatment system was constructed to neutralize a point source of AMD discharge in Black Fork. The toxic water was coming from the Tropic Mine, an underground coal mine that was abandoned in 1923.